When you initially start experimenting with Farm Town, it is extremely common to become overwhelmed with all of the countless features, and devote significant amounts of time towards features that aren't particularly going to contribute greatly to your success. If you want to do well, however, it's quite important to get your priorities straight when first starting out. 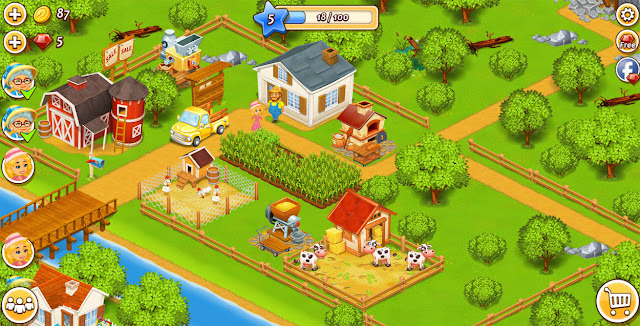 While there are multiple ways to generate money in Farm Town, the most prominent way is definitely through the harvesting of crops. Therefore, when playing Farm Town, your number one priority should definitely be the crops. One common mistake that players often make is planting their crops too far apart. By planting your crops far apart, you are actually cutting your total harvesting area in half. By default, when you plant crops, there is a plot of land in between each plowed plot. Countless users are fine with that, and just leave the empty land there. By getting rid of the space between crops, however, you can literally double the amount of area that you are able to harvest. To do this, select the icon of the wrench. Then, simply hit the box that says “remove spaces between fields”. Sadly, this will only apply to future crops, so you'll have to bulldoze your current crops if you would like to move them closer together. Another way to add to productivity is to increase the speed at which you plant seeds or plow fields. When you plow in different directions, your avatar often has to meander around to reach the different areas. Using all of this effort moving around the field costs more time, and you will plow significantly more efficiently if you plow without moving. To change this, click from the top right to the bottom left. By doing so, you will plow without moving, and therefore will save a significant amount of time. One more significant blunder that countless users frequently commit is emphasizing the wrong crops. Numerous users will dedicate effort harvesting crops including pineapple or pumpkin, solely due to the fact these foods taste delicious in real life. If you hope to get the most you can out of your crops, however, you should focus on the crops that return the most yield. Out of all the crops, the ones that are clearly most worth planting are the raspberries. Due to the fact that raspberries can be made so quickly, you can make a huge amount of them over the course of a day. No other Farm Town crop will provide you with nearly as much experience as raspberries. Due to the fact that the seeds can be bought for extremely cheap, they also return the most money as well. Rather than spending your time on tons of crops that don’t provide significant amounts of money or experience in return, invest all your time in to planting raspberries. While there are numerous critical features to building a great farm, few are more important than the physical crops you produce. By spending a reasonable amount of effort getting the maximum you can out of your crops, your farm will develop a lot more successfully, and you will be that much closer to helping it reach its maximum potential.